This can be worn a number of ways . It is an amazingly beautiful piece! This hand cast piece combines many of the elements that make Celtic art outstanding, There are three bosses representing eggs or rebirth. There are woven Celtic interlace designs between the bosses all along the circular penannular ring. These are the symbol of eternal life. The three raised relief circles, two on each side of the opening and one on the pin stem have intricately engraved triquetra and triskele. Surrounding the triquetra's and spiral trickles there is round granulation for which the Celt jewelers were renowned. How did they do that with the crude tools that existed eons ago? A truly stunning piece that is sure to draw both admiration and comments. The hallmark is very hard to read but the makers name CA is visible. 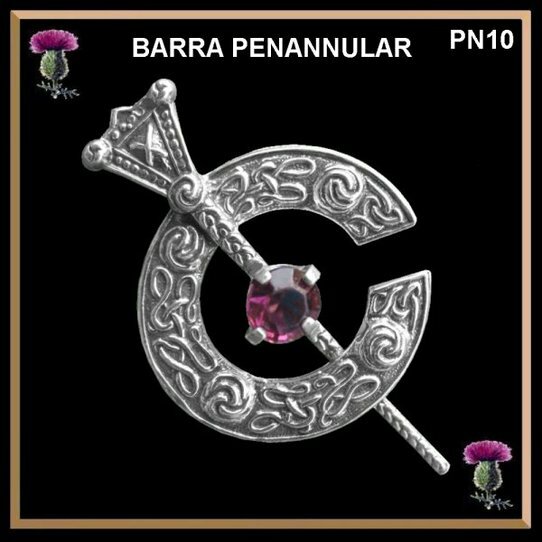 This stands for a Celtic Arts. A very high end extremely collectible old silversmith company that started in the early 50's.